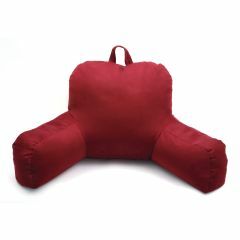 AllegroMedical.com presents The Porter Bedrest, Maroon- Brushed Porter Bedrest, Maroon - Micro Suede Bed Rest Lounger. Porter Bed rest provides a functional pillow that allows anyone to lie in bed and read, work or just watch TV comfortably. This bed rest has a handsome high low variegated plush that looks great and wears well.